I’ve always loved the idea of waking early and setting aside some time in the morning for spirituality — a walk to the park, a session of morning pages, a few minutes of prayer or meditation, or even a chapter in an inspirational book. Since I began teaching, those mornings have been much rarer than they used to be. In an effort to encourage myself to wake up earlier, I set up a little altar space in the living room, complete with a full-spectrum sun lamp, a chalice, and a basket of books. 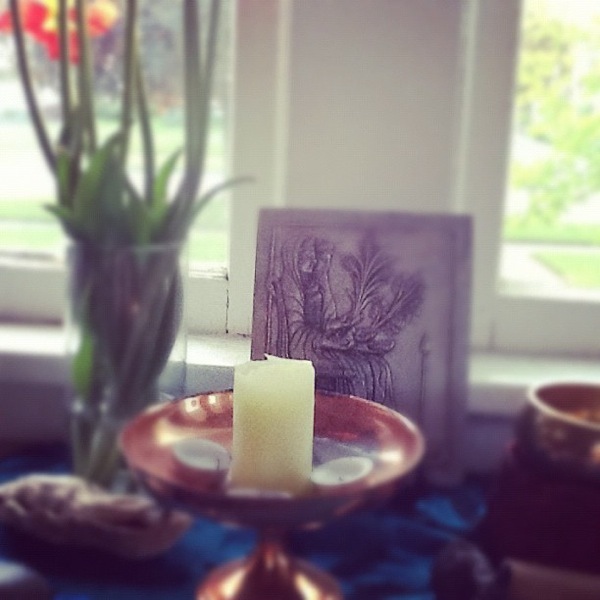 Here is a little snapshot of my altar I took using Instagram. The tulips were a gift from my husband; the Persephone and Hades plaque is a recent find from Seattle. Despite that incentive, I still struggle to drag myself out of bed with any time to spare in the morning. That is why it took me several months to make it through Care of the Soul by Thomas Moore. At any rate, even as I closed the last page of Care of the Soul a few months ago, I knew that it would be a book I’d refer back to often. Sure enough, I’ve been thinking of it a lot lately, maybe because my husband, Drew, recently referenced it in his learning blog. Lately, I’ve been struggling to find a sense of stability in my life. I find myself craving the structure of purposeful discipline. Too often, it’s a struggle just to eat dinner before 9 o’clock. I’m trying to impose some order on my life, chipping away at the chaos with a day planner and the sort of desperate smile that stretches our faces just before we burst into overwhelmed tears. I knew at once that Care of the Soul would become a powerful ally in this quest for stability. 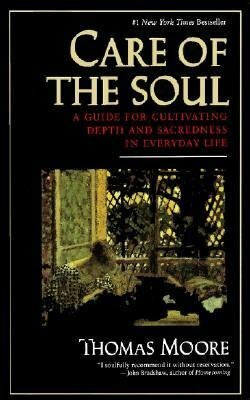 I found myself nodding when Moore wrote, “Care of the soul is a continuous process that concerns itself not so much with “fixing” a central flaw as with attending to the small details of daily life, as well as to major decisions and changes.” Those small details are the ones I struggle with the most. It’s easy enough for me to scrub down my kitchen once a week, but so much harder to keep it clean, to load the dishwasher and wipe down the counters before bed so that I can wake to a clean palette for my morning smoothie and coffee. I want to learn to cultivate beauty in my life, for beauty nourishes the soul. And I want to spend another series of mornings re-reading this book — I feel like I’ve only begun to glimpse the lessons it can teach me. This morning, again, I tumbled out of bed with barely enough time to shower, dress, and jump in the car for work. I’m going to bed too late again tonight. But I’m going to challenge myself anyway — I’m going to set my cell phone alarm for 5:00 a.m. tomorrow and scrape myself out of bed without hitting snooze a dozen times first. If nothing else, I’d like to spend 15 minutes with my mood lamp and a cup of coffee tomorrow morning. It’s a little thing, but it is on such little rituals that we build the foundation of our lives.